They are the creatures of nightmares; hovering and fluttering around in the dark, stoking our fears and haunting our dreams. Long before Bram Stoker's famous novel, Dracula, bats haven't been one of the most beloved mammals on Earth. But why is this so? Our fear of these misunderstood creatures probably emerged from the dark caves around the world. For early man, these massive caverns were pathways to the underworld; corridors to the realm of demons and other otherworldly beings sent by the gods to punish and torture wrongdoers. As such, creatures that resided in these dark holes, for example bats, were seen as extensions of the evil underworld. They were to be feared and respected in order to prevent misfortune. The Bat came to symbolize Disease, Destruction, and Decay. In the Oxacan tradition, bats were evil beings filled with rage and jealousy; they were bitter about the fact that they lacked the beautiful feathers that birds had. Tales from Nigerian and Mesoamerican folklore shed light on the bat's tendency to cling to darkness. In these tales, the Bat always does a petty act that causes great harm to other animals. In shame and guilt, the winged creature hides, remaining out of the prying eyes of Light and Truth. These tales have fed our western views of bats and have led to their association with the Devil, vampires, and everything that goes bump in the night. In some schools of thought, it is said that bats are the reasons for women adorning their heads with hats while attending church services. An old wives' tale makes note of the animal's tendency to dive bomb from the sky and swoop down atop people's heads. Although the poor creatures are, in reality, hunting for the mosquitos and other insects that buzz around your head, many persons (even to this day) believe that an uncovered head of hair attracts the Devil and his demons - seeing that bats are so closely linked with the underworld and evil. For this reason, many Christian traditions state that women should cover their hair, especially when in a house of worship, in order to prevent demons from being attracted to their heads. But not every culture sees these poor creatures as emblems of evil. In China, they are good omens; symbols of Happiness, Longevity, and Prosperity. In some parts of southern Europe, bats are heralded as heroes and their images are proudly displayed on family crests and royal flags. This may account for why Marvel comic creators gave birth to the legend of Batman. In Native American eyes, the Bat is a symbol of Rebirth and Family. These highly social creatures live in vast groups and are renowned for their communication skills. Every night, they emerge from the realm of Darkness and Death, having been reborn and renewed by Mother Earth in the depths of her womb-like caves. The Bat has a few habits that can be seen as down-right creepy, but it is hard to see this creature as the evil, soul leach that we've made him out to be over the centuries. They are beautiful and majestic creatures, but just a little misunderstood, that's all. From the mysterious outlines of a typical Halloween scene to the proud emblem reminiscent of Batman's call sign, Bat Tattoos come in a variety of styles. Most images tend to have gothic themes running through the course of the design; this is usually in keeping with the animal's dark, mysterious, fear-inspiring, and generally negative reputation. Like soul mates experiencing life together, Bats and Death go hand in hand. 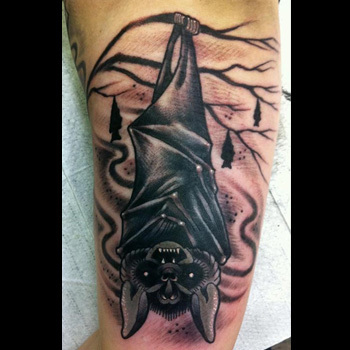 Death Bat Tattoos are not necessarily gothic and dark; they bring with them a way to take a more sombre look at life. Bats have the dual image of being both a harbinger of Death and a being of Rebirth and Renewal. Death Bat Tattoos represent the Cycle of Life; the ebb and flow of Birth and Death and the deeper meaning of man's existence. Wings are objects of flight; representations of a free spirit and an uninhibited mind. A Bat Wing Tattoo, in essence, is a means of communicating your desire to be uninhibited and free. You identify with the dark spirit of the Bat and are not bogged down by a rose-tinted view of the world around. Despite being vulnerable, you are able to rise up from the depths and soar high in the skies. Showing off your mysterious presence can be a tricky undertaking. How can you find the right balance between your unique identity and the message that you are trying to communicate to the world? What will your new tattoo really represent? Where will it be on your body? The theme? The design scheme? Your ink is not easily erased, so it pays to spend some time getting the details just right. Need inspiration? Then the Custom Design Service offered by our team of great tattoo artists is the answer to your problems.